The ability to rescue a fallen person is required on any site where persons are working at height. It is often forgotten that the reason people wear harnesses is to prevent them from falling however these serious incidents can occur. It is every employers responsibility to ensure that if a person does suffer a fall and is suspended in a harness that they must be able to recover them as quickly as possible. In this event it is also important that the rescuers are not put in further danger to carry out the rescue. The BFMRGH piece of equipment and the rescue pole provide for this by not adding to the hazardous situation by putting the rescuer in any danger. 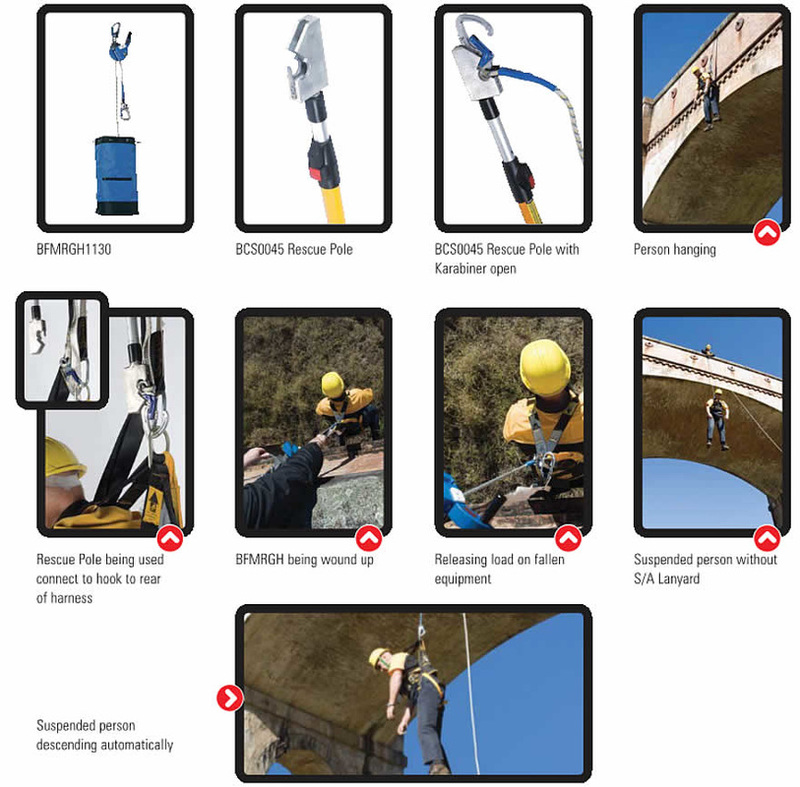 The device is designed to be able to reach the suspended person with an open double action hook and attach this to the suspended person through the rear Dee of the harness. This means that if the suspended person is unconscious no further help is required as the attachment can be made without the assistance of the suspended person. Once the hook is in place the suspended person can be raised to allow for the loaded equipment to be removed. Once this is done the person can be automatically descended to the ground by the of BFMRGH device.